Bill Clinton has 2 media appearances. William Jefferson Clinton discusses Between Hope and History. Carlotta Walls Lanier attended Michigan State University and graduated from Colorado State College–now the University of Northern Colorado, on whose board of trustees she sits. After working for the YWCA, she founded her own real estate brokerage firm, LaNier and Company. A sought-after lecturer, LaNier speaks across the country, and she has received the Congressional Medal of Honor and two honorary doctorate degrees. She is the mother of two children, Whitney and Brooke, and lives in Englewood, Colorado, with her husband, Ira. Bill Clinton's book Hearts on Fire was available from LibraryThing Early Reviewers. Bill Clinton's book The Southern Tiger was available from LibraryThing Early Reviewers. Bill Clinton is currently considered a "single author." If one or more works are by a distinct, homonymous authors, go ahead and split the author. 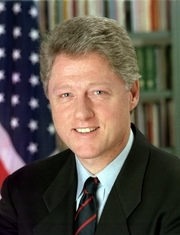 Bill Clinton is composed of 9 names. You can examine and separate out names.